PLEASE NOTE THESE DETAILS CAN BE SUBJECT TO CHANGE UPON THE DISCRETION OF THE RACE DIRECTOR. 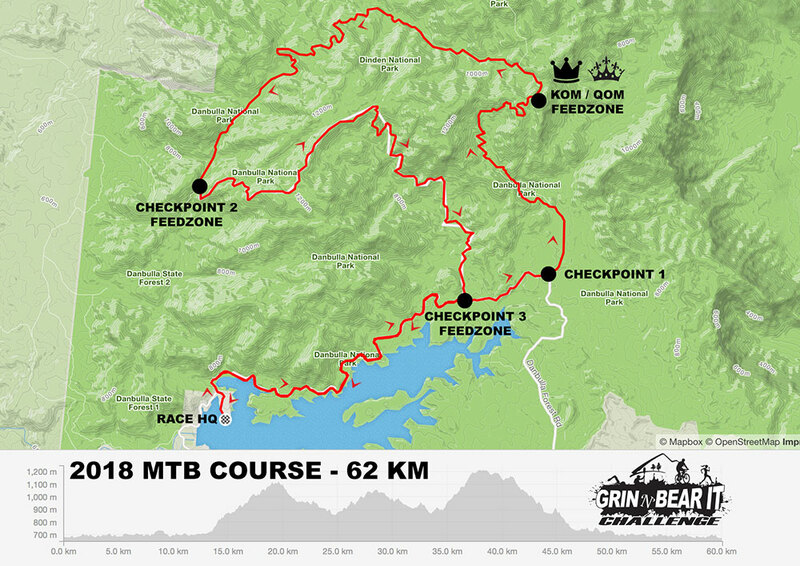 A rewarding challenge for the well prepared multisport athlete, the Grin n Bear It course will prove testing, tough and truly wild – but incredibly scenic and satisfying, to anyone chasing an adventurous achievement. The (mostly) sheltered Torpedo Bay to the West of Barrabadeen Peninsula will host the Swim Leg. In late August water temperatures are likely to be closer to cool than freezing and Barrabadeen blocks the predominant South Easterly breeze, making for an achievable and awakening first leg. Paddle: 2 x 6km laps. At the completion of the swim, participants will collect paddlecraft and associated equipment and head west, straight across Barrabadeen Bay. A sharp left hand before the shore directs paddlers towards Tinaroo Village and then out into the more open and potentially exposed waters of Lake Tinaroo. Paddlers will head East past Platypus Bay Campground and steadily turn North East, keeping the Danbulla side of Tinaroo on their left and Fong On Peninsula on their right. A boat flying the Grin n Bear It Flag marks the turnaround (at approx 4km). From here competitors will hug the shoreline on their return, paddle directly past Barrabadeen headland and back across to the bouy at the western side of Barrabadeen Bay to commence their second lap. At the completion of the second lap paddlers will turn right as they pass Barrabadeen headland and back to shore to complete the paddle. Note: Paddlers should keep to the left of marker bouys, except the final bouy directing them back into Barrabadeen at the completion of the second lap. MTB’s will replace paddlecraft for Leg Three – a 64km, two wheeled, scenic and diverse tour of Far North Queensland’s Wet Tropics, as much as a Multisport Race! As riders depart Barrabadeen (680m asl) they will turn right onto Danbulla Road and after a few km’s the bitumen surface will become dirt. The ride initially traces the shoreline which was the earlier paddle leg, but continues beyond the Kauri Creek Camping Area (paddle turnaround), past the Kauri Creek Day Use Area and Kauri Creek Road Intersection until the intersection with Mt Edith Road is met. Riders will turn left onto Mt Edith Road and begin a gentle 2km climb Northwards up and away from Tinaroo. With false sense of securities firmly set, Mt Edith Rd then takes riders on a steep but scenic 6km climb, winding past stunning creeks and massive boulders along the ascent almost to the very summit of Mt Edith (1149m asl). The KOM/QOM point is at approximately 20km. A thrilling descent then drops riders North West into the Emerald Creek Catchment before hooking South West and undulating up towards the junction with Kauri Creek Road. Riders turn left and up Kauri Creek Road for a climb not too dissimilar in both length and height to the Mt Edith climb. At the top of the climb (1220m asl) riders return to steady undulations before a long and extended descent with only very brief climbs to remind legs of their state of fatigue. Kauri Creek Road returns to Danbulla Road East of Barrabadeen so riders will turn right and make their way back along the shoreline, via Danbulla Road to where they began and the final Run Leg. The approximately 12.5km run leg starts and finishes at Barrabadeen. From Race HQ competitors will cross the driveway and onto the trail on the eastern side of Barrabadeen. At the abseil rock competitors take the ‘stairs’ to pop back onto the driveway & down to Danbulla Drive. 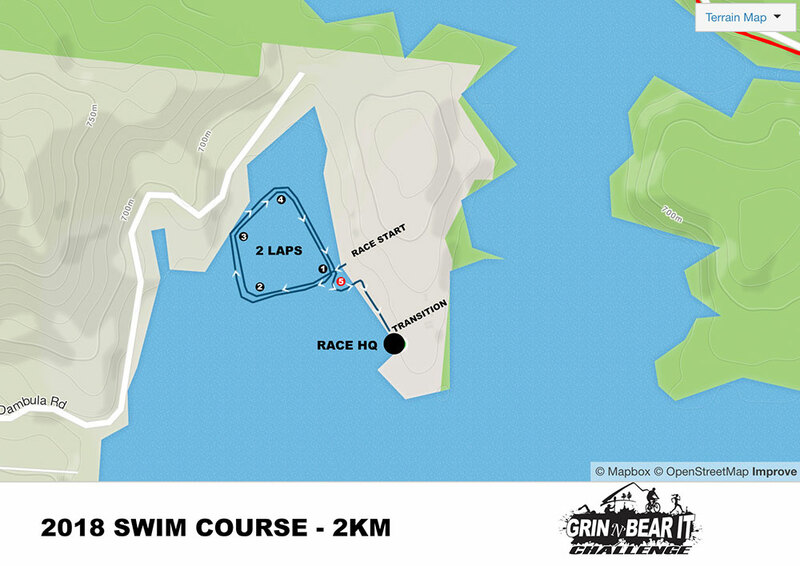 After crossing Danbulla Drive, a two-lap course winds up and around the rugged single trails and granite outcrops above Torpedo Bay. Glorious views over the Atherton Tableland, steep descents to the dam wall & the vista from Danbulla Drive will be the highlights of the run leg – depending on the condition of one’s thighs – with views to Barrabadeen and the Finish Line sure to motivate even the weariest of participants. 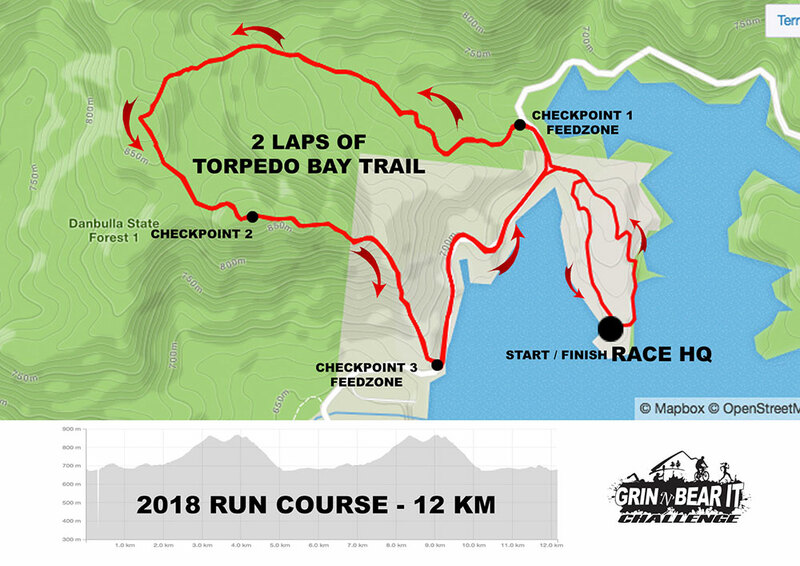 After completing 2 laps of the Torpedo Bay – Danbulla Drive loop, finishers will head back into Barrabadeen & veer off the driveway, through the campground along the western foreshore to complete this epic challenge. A tremendous sense of achievement awaits them along with eternal glory, some serious multisport kudos and a face full of the ‘Grin’ inspired by the events’ title and the size of each and every participants’ accomplishment. *All stages are subject to change. * Entry numbers will be limited. Cut off times will be enforced at the discretion of the Race Director. 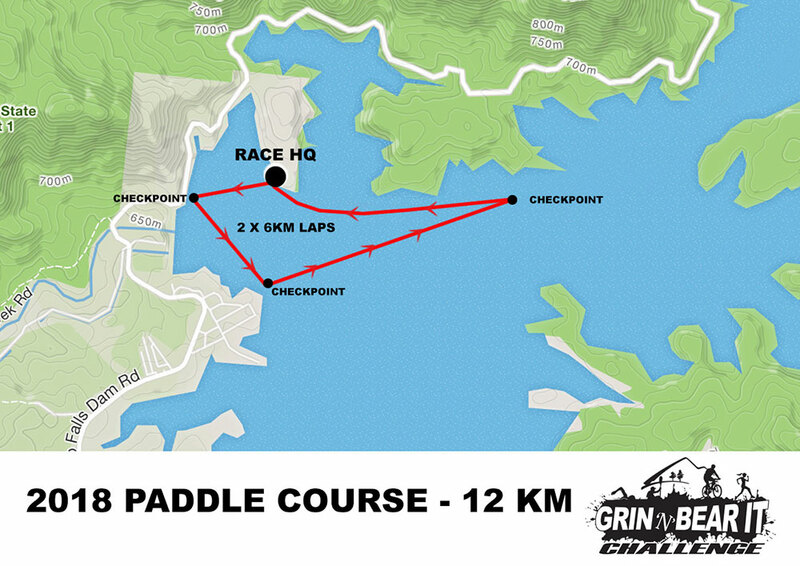 Swim – 8.30 am – wetsuit optional, swim caps will be provided Paddle – 10.30 am – own craft, Australian Standard PFD required. Bike – 3.30 pm – helmet to Australian Standard, bikes to be recently serviced & well maintained, competitors to wear appropriate clothing to cover torso. Run – 5.30 pm – Runners are advised to be self sufficient & carry some water and food on the run course.